Jimmy is a lovely fawn boy who does well at specialty level. He has a true gait with an easy side movement typical for the breed. We are thrilled with Jimmy as a sire. He has had several litters now and in every litter, there have been lovely pups for the breeders to continue with. Jimmy is a Best In Specialty Show winner under the renowned Jon Gunn of Skyeway fame. 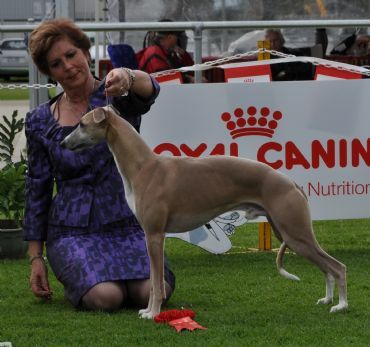 He was a Reserve CC winner under Roma Wright-Smith of Silkstone UK and he was a Sydney Royal Puppy of Breed winner in 2012. He was placed 2nd in a strong class at the National in May 2013, Reserve Dog CC under Pauline Oliver of Spyanfly UK and is always placed at breed shows. He is a lovely boy with that typical soft whippet male temperament, excellent with baby puppies, obedient and always close to our side.